Olaf graduated in Environmental Sciences at the University of Lueneburg, Germany, after which he worked on atmospheric models at the Institute of Coastal Research in Geestacht, Germany and later co-ordinated scientific panel meetings for the European Food Safety Authority. 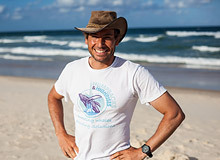 He started his PhD at Griffith University in 2004 on the relationship between fish harvest and environmental drivers, where he developed advanced short and long-term tagging methods for estuarine fish. 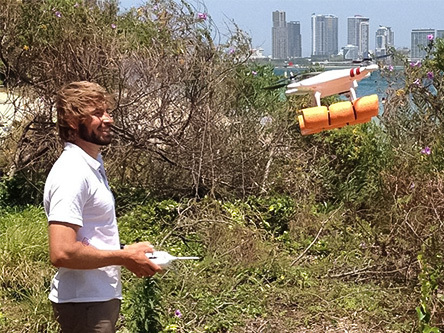 Since 2008 he is a Research Fellow with the Australian Rivers Institute. Olaf is the co-founder of Humpbacks & High-rises - a not for profit research organisation dedicated to urban marine mammal research and protection. What inspired you to research humpback whales? Their size. Well, their size because I was surprised to see that some of the most basic ecological questions have still not been answered for one of the largest animals on earth. For instance, it is still unknown how they navigate, find their food and how the different populations are connected. We also struggle to determine their different behaviors. Considering the economic importance of humpback whales as a whale watch species, a good understanding of their ecology and behavior is crucial for a sustainable whale watch industry. And then, of course, humpback whales are amazing. What has been an exciting moment in your field research? I still remember very lively and clear when a young calf came up close to our research vessel. The new born was the size of our boat and emerged about one meter away from us. We were suppose to tag the mother with a suction system that had a camera instead we completely forgot our mission and just laughed at each other in joy. The calf rolled around, moved under the boat and made a circle of air bubbles. Why would you like to engage with citizens scientists? I like sharing my knowledge, expertise and excitement about the work I do. As scientists we are faced with millions of tasks but one that is very important is sharing our knowledge with others and help create a world where knowledge overcomes fear and misunderstanding. It is also great to have some helping hands and extra eyes to get the job done. Field work is usually the most fun and exciting part of research.